No, not that Jamie Oliver. This Jamie Oliver is the man currently occupying the drumstool for punk favourites UK Subs and is one of punk's up-and-coming drum stars. After a spell laying down the scatter-gun beats for female-fronted Coventry punks Dragster, Jamie was recruited to the UK Subs. Since then he's honed his chops with hundreds of shows a year, often playing more than one punishing set each night. Citing influences as diverse as Danny Carey and Chris Adler to Steve Gadd and David Garibaldi, Jamie is making a name for himself thanks to his cultured yet hard-hitting style. Here, he gives Rhythm his key tips for punk drummers. What attributes do you need to be a punk drummer? "A twisted sense of humour! No, but that's the beauty of punk, you don't really need anything." Does the nature of punk drumming make touring more physically demanding? "It depends on the band. Punk has a tendency to be quite fast. That's the kind of stuff which is most demanding I think, especially when you're a hard-hitting drummer like I am. With UK Subs though, our music isn't that fast. The thing that does make playing with UK Subs physically demanding is playing the set with no gaps between songs, I don't even have time to grab a quick swig of beer!" How do you feel about the current crop of punk drummers? 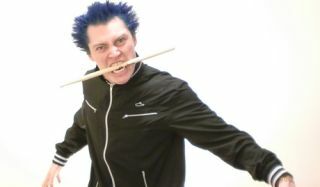 "I tend to prefer drummers who bring elements of other styles into punk rock. I have a very eclectic taste in music, so if I hear a drummer playing in a punk band, and they play something which is stylistically atypical to punk, I pay more attention. Drummers like Travis Barker, Robin Guy and Vom Ritchie are all perfect examples of what I'm talking about. They make themselves indispensable in my opinion." How do you think the up-and-coming punk drummers compare to those from the past? "I definitely think the quality of drumming has gone up. And I think that's partially down to players like Travis Barker. I see a lot of kids trying to emulate what he does, from the way he looks, to his style of drumming, and even the way he moves when he plays. Digital recording is a big factor too. You can now shift beats around and get the drum parts perfect in the studio, and that puts greater pressure on drummers to get it right in a live setting." Key kit: Jamie uses Yamaha Stage Custom drums, Stagg cymbals, Yamaha hardware, Remo heads, Pearl Demon drive pedals and Vic Firth sticks.